So, London Fashion Week is all but over for another six months but don't fret because we've listed our favourite bits so you can relive the action time and time again! 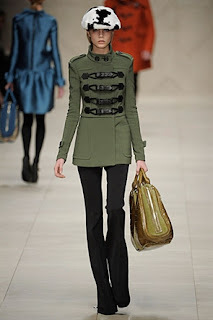 Our top five collections were: PPQ, House of Holland, Topshop Unique, Burberry and Ashish. With accessories like mega, statement jewellery and ice-cube bags, what's not to love about this collection? We found the cat ear hats and Heidi braids wacky and thought the ruffle detailing, sharp tailoring and full-on shoulders were gorgeous. We can't wait 'til next season to see if this whole look takes off! 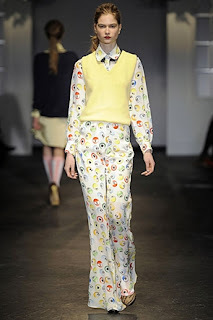 You can always rely on Henry Holland to pull something quirky-cool out of the bag and he did just that with his theme of OAP chic (yes, you read that right, Granny is king for A/W 2011)! We loved the candy coloured suits worn with stripey ankle socks, and the bingo ball print jumpsuit, well that's a massive WANT! Another show bordering on the eccentric (do you see the pattern here?) was Topshop Unique. 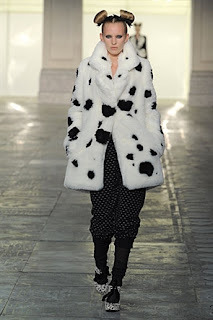 This show had a running 101 Dalmations and Cruella de Ville theme, with lots of dalmation fur and models sporting hair shaped like dog ears, and noses painted like our furry friends! Our favourite looks included silk blouses with Peter Pan collars and faux-fur trimmed dresses. The Burberry show was in a league of its own, with a soundtrack featuring Dusty Springfield and Adele, a finale including fake snow falling with models wearing cute little clear ponchos and a FROW full of a-listers, including Kate Bosworth, Alexa Chung and Anna Wintour! An absolutely beautiful display of coats and other pieces inspired by the 1960s. We wanted it all! And finally, an absolutely bonkers offering from Ashish. 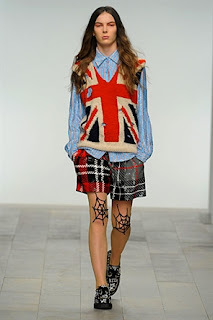 We're talking sequinned tartans, ripped jumpers, union jack tank-tops and models with cobwebs painted on their knees! We'll definitely be looking out for this collection come next season, can't wait!